Everywhere I look this fall I find apples: hanging from the gnarled trees in the untamed orchard of our back field, clinging to the branches of the spindly old apple trees along the back roads of my regular travels, beckoning from gone-wild trees encroaching the parking lots of downtown stores. More apples in more places than I remember from past autumns. They taunt me in their numbers, and I feel a slight desperation to pick as many as I can, lest they all go to waste. This is the reason I sow only two zucchini seeds in my garden each spring, and plant only a few tomato seedlings. This is why in August I had to make myself ignore the wild blueberries still so copiously ripening in a field we passed nearly every day. There are only so many ways to eat zucchini. I’ve never been much good at making tomato sauce. We ran out of room in the freezer for blueberries – and my children grew tired of my endless, insurmountable desire to pick berries in the hot sun when there was cool water just around the bend. I have a hard time letting the extras go. So I have been making applesauce and apple crisp and apple muffins. There is comfort in the scent of warm apples mixed with cinnamon wafting from the kitchen on a fall day, when the air is crisp but not cold, when the leaves are changing but have not yet left the trees bare of color, when the grass still needs mowing but is sometimes crusted with frost in the morning. I have tucked apple muffins into lunchboxes this week and apple sauce into the freezer. We have feasted on apple crisp, spiced and warm from the oven and topped with melting ice cream. I feel as if I could – and should – keep processing apples until the pantry and freezer are full. Even then, the trees this year would still not be emptied of their fruit. The apple trees around our house, planted in some long ago time, are a hodgepodge of long-forgotten varieties. There are about three dozen trees, some scattered without any apparent plan, others in wavering rows still evident if you look closely enough. I’ve only begun learning how to prune the trees, tackling a few late last winter, and so they are overgrown, triple the height of commercial orchard trees, with branches twining every which way. Some lean awkwardly off-kilter. Others have fallen or split and decayed and been finished by the chainsaw and added to the woodpile. 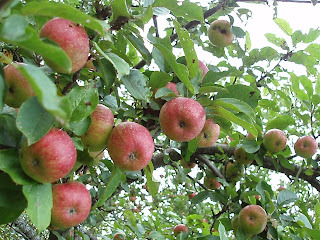 The apples growing through the field and in the side yard are green or red or pale and golden. These are not the large, perfectly formed apples of a professionally-tended orchard, nor do they hold the unnatural sheen of polished grocery store fruit. Most of our apples are not great for eating plain; they have good flavor but chewy skins, or the tartness is too biting. But they are great for sauce and for baking. The animals we share this space with seem less picky about the flavor, the toughness of the skins, the spotted imperfections of our apples. Game trails wind through the fields, narrow swaths parting the tall, yellowing grasses and still-blooming asters, leading to the wild creatures’ favorite trees. One tree, just beyond the back garden and at the edge of the forest, holds small, yellowish-green apples, not much to look at, and too high for us to reach. The bears love that tree. When my own children were too small to climb trees, there was a mother bear eating the windfall apples on the ground one day while her four cubs clambered around in the tree above her, each one clinging to a different branch. Last winter, a gray fox made regular visits to the apple tree behind the clothesline, her dainty paw prints pressed into the snow all around the tree’s trunk. Not long ago a porcupine spent the morning in the branches of the apple tree closest to the house. Days later, another, larger porcupine settled below the same tree, reaching up casually every few minutes to grab an apple from a low-hanging branch, then sitting back on his haunches to enjoy the snack. Moose, deer, raccoons, turkeys: we’ve seen them all noshing on the apples, from late summer into frozen winter. No, these apples won’t go to waste. Not with such a wild menagerie to finish them off. Still, I feel an obligation to do my part to lighten the trees’ heavy fall burden. I keep picking the apples in small batches, sometimes with the help of my children, filling coat pockets and shopping bags to carry these small treasures to the kitchen. We pile them there, like a promise, waiting until there’s time to fill the house again with the sweet tang of apples mingling with cinnamon. Original content by Meghan McCarthy McPhaul, posted to her Blog: Writings From a Full Life. This essay also appears as Meghan's Close to Home column in the September 25, 2015 edition of the Littleton Record. It’s hard to tell how many pumpkin plants are growing in the tangle of thick vines and giant, prickly leaves at the west end of the vegetable garden. I didn’t plant any of them. At least not directly. The vines, just tendrils at the start, really – delicate and green – sprang from the compost pile after the potatoes and zucchini, eggplant and cucumbers, green beans and carrots had been planted. Those curling shoots, dainty as they were, stood in unruly contrast to the tidy rows of seeds and seedlings tucked into the spring garden. At first I wasn’t sure what was growing from the fertile pile of discarded greens and kitchen scraps in varying degrees of decomposition. Could it be summer squash? Cucumbers? Certainly something in the Cucurbita family. As the leaves grew wide, and huge, orange flowers unfurled, it became clear these were pumpkin vines, no longer delicate, but thick as my thumb and growing fatter by the day. From a multitude of flowers emerged a single pumpkin. A baby: no bigger than a gumball, streaky green, and clinging serenely to a swelling vine. 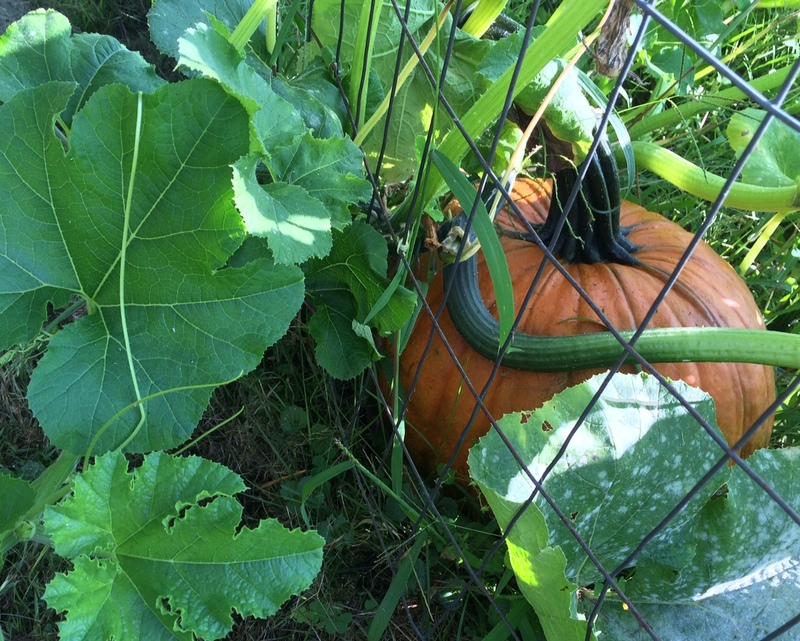 I struggled through recent memory to figure how a pumpkin ended up growing from our garden compost heap. I remembered the deer – our Winter Deer, we called her – who frequented that heap from first snow late last fall until the drifts got too deep to traverse from forest to garden. It was the discarded Jack-O-Lantern, chucked into the compost, that initially attracted the Winter Deer; we first spotted her near dusk as she nosed through the wire fence at the frozen, orange shards. Soon she was visiting several times a day, leaping into and out of the garden, and ruining the fence in the process. But the inadvertently planted pumpkin seeds would have arrived earlier in the fall, before the ground had frozen, when we carved farm-bought pumpkins and tossed their slimy, many-seeded innards atop the compost pile. Comprising the discarded bits of many fruits and veggies, the compost heap often sprouts haphazardly with volunteer plants during the summer. I am always amazed these seeds can lie dormant through the frigid winter and soggy spring and still germinate come warmer weather. I regularly pull unplanned potato plants, stringy tomato seedlings, and opportunistic onion greens from that corner of the garden where we throw the scraps. But something inspired me to leave the pumpkin vines be. At first it was mere curiosity, a desire to discover what was growing there. When the tiny pumpkin appeared, I figured we’d watch it for a while to see if it would survive – and whether other tiny green orbs would swell from the vines. Our lonely pumpkin has grown steadily through the summer and is now beach ball-sized and almost completely orange. Its size and near-perfect shape seem fitting for a midnight transformation into Cinderella’s carriage, if only we had a fairy godmother in the neighborhood. Alas, the pumpkin remained alone, one giant squash amid all those leaves and blooms. Until last weekend, when I noticed one more small, green, baby pumpkin on a section of the vine twisting through the fence and onto the lawn. Then I saw another, and another. I counted a dozen new pumpkins: late bloomers in this early September heat wave, but there nonetheless. It seems unlikely they’ll all grow large and ripen before the air turns frosty and everything remaining in the garden withers to brown. Despite this week’s heat, after years of New England life experience I know the temperature may plunge any day now. But the new pumpkins are growing fast. Some of them are already nearly the size of tennis balls. Perhaps our accidental pumpkin patch, sprung from last year’s Halloween remains, will yield this fall’s Jack-o-lanterns. Original content by Meghan McCarthy McPhaul, posted to her Blog: Writings From a Full Life. This essay also appears as Meghan's Close to Home column in the September 11, 2015 edition of the Littleton Record.